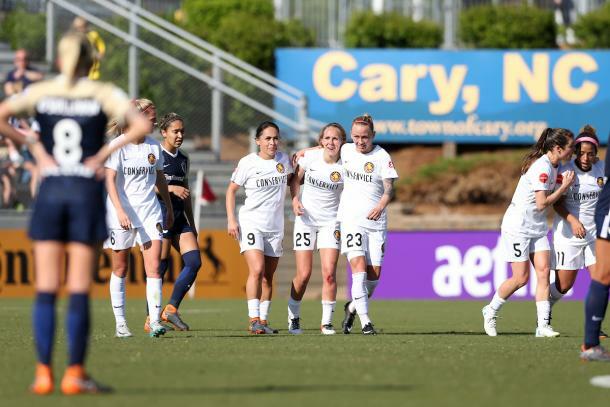 After an eventful 90 minutes the Utah Royals were able to earn their third tie of the season against the undefeated North Carolina Courage in a 2-2 draw. SCORE: 1-0, min 6, Mathias. 1-1, min 52, Stengel. 1-2, min 66, Ratcliffe. 2-2, min 80, Dunn. REFEREE: Yellow Card: Kristen Hamilton (min. 18), Abby Dahlkemper (min. 87), Brittany Ratcliffe (min. 28). 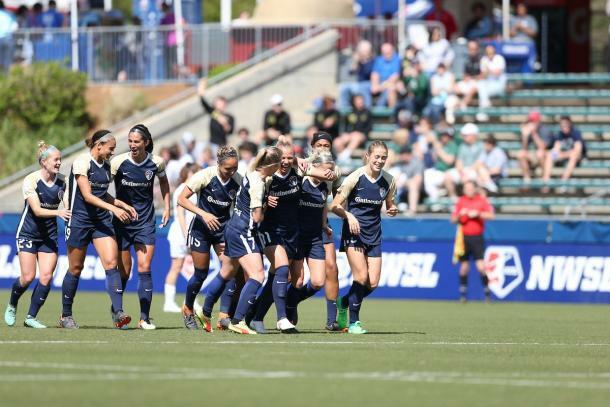 In the Lifetime Game of the Week, the North Carolina Courage welcomed new-comers, Utah Royals FC. The Courage were looking to get their fifth consecutive win of the season but to most people's surprise only came away with a point. Compared to the last five games, the Courage decided to get a goal right off the bat instead of waiting for the 90th minute to hit. Six minutes into the match, a cleared ball fell right to the feet of Merritt Mathias. The right-back hit a world-class strike from outside of the 18 yard box and into the upper 90 to give the Courage the lead. The remainder of the half remained in favor of the Courage. A strong defensive effort only allowed one shot for the Royals. Utah struggled to settle down and get pass the Courage defense. Where as North Carolina's offense was another story. They were able to end the half with six shots, one on goal, 14 crosses and seven corners. The only opportunity the Royals had to threaten the North Carolina defense was when Kelley O'Hara got into the attacking third and had the lone shot for Utah that was handled by Courage goalkeeper Katelyn Rowland. Utah coach, Laura Harvey must of brought her team into the locker room at the half and gave them a stern talking to because the game was turned around in the second half. In the first four minutes of the half, it looked like the dominance of North Carolina would continue over into the second half. Abby Smith was forced to make a diving save to make sure the Courage didn't double their lead. Just minutes later, the Royals countered and equalized the game in the 52nd minutes. A miscommunication between Abby Dahlkemper and Katelyn Rowland allowed Katie Stengel to get a head on the ball and score the equalizer for the Royals. In normal North Carolina fashion, it would have seemed the Courage would have been able to find another and take the lead again but Utah had other plans and made it difficult for them to find the back of the net. In the 66th minute, the Courage saw another defensive error that led to the Royals taking the lead. A poor clearance from Rowland landed right at the feet of Brittany Ratcliffe who struck the ball from the corner of the 18 and gave Utah the lead. As the clock ticked down it was getting harder and harder for North Carolina to find the equalizer. It wasn't until the 80th minute, Crystal Dunn scored her second goal of the season to tie the game. This goal came off of yet another defensive error. Utah goalkeeper Abby Smith came off of her line to clear the ball. The clearance was partly block and landed right in the path of Dunn. The Courage continued to threaten for the remainder of the game but were unable to find the third goal. An impressive performance from Abby Smith allowed the Royals to leave their road trip with a point. In the second half they also found the offense they have been looking for in their first few games. Utah will return home to take on the Portland Thorns as they search for their first franchise win. The Courage were unable to get their fifth win but were able to continue the undefeated streak for this season. With another late goal North Carolina continue to show their strength in never giving up and pushing the entire 90 minutes. 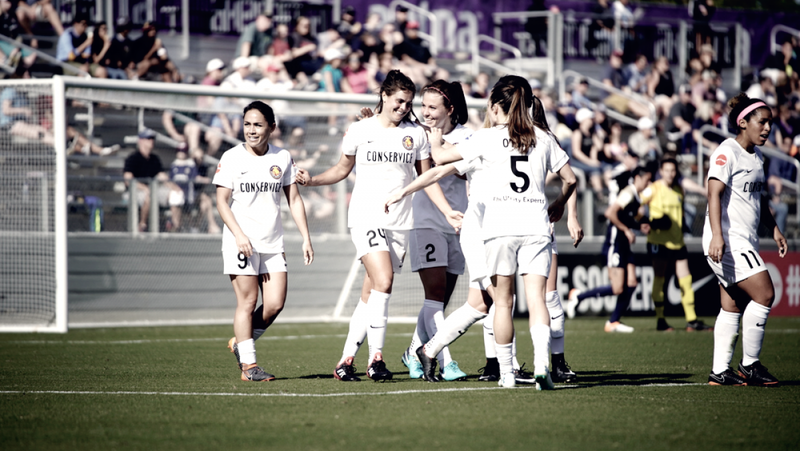 Next week the Courage will head over to Houston, Texas to take on the Houston Dash in the Lifetime Game of the Week.